Antibodies you can rely on. The authors investigated the interactions of pro-survival and pro-apoptotic receptors in Programmed Cell Death (PCD) using the sympathetic nervous system as a model. They demonstrate that Ret, a receptor tyrosine kinase required for the survival of many neuronal populations, is restricted to a subset of degenerating neurons that rapidly undergo apoptosis. Non-canonical Ret signaling augments p75-mediated cell death in developing sympathetic neurons. Donnelly CR, Gabreski NA, Suh EB, Chowdhury M, & Pierchala BA. (2018) J Cell Biol Biol, 217 (9):327. NIH/3T3 cells were transfected as indicated (Ret51 and p75 [left] or HA-tagged Ret51 and p75 [right], with higher magnification panels displayed on bottom), followed by brief fixation. DuoLink proximity ligation assays were performed using Anti-p75 (Cat. #AB-N01) and Anti-HA primary antibodies. 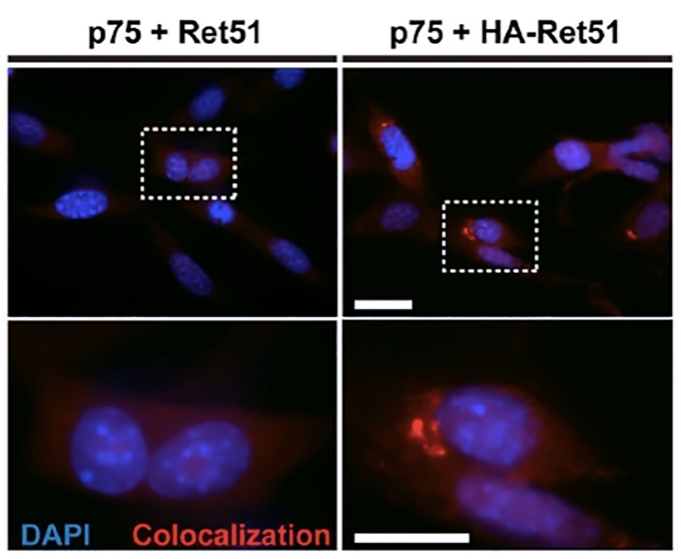 Red staining indicates colocalization pattern observed in 3T3 cells transfected with HA-Ret51 and p75 compared with Ret51 and p75-transfected 3T3 cells. Bar, 20 μm.